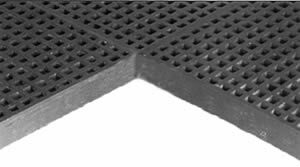 MiniMesh™ grating is designed to be a low cost alternative to aluminum, steel, stainless steel and other metals for applications where corrosion resistant underfloor access and unobstructed air flow is required. Lightweight MiniMesh™ panels are easily removable, providing ready access to electrical conduits, air supply plenums, and service lines. MiniMesh™ panels minimize vibration from rolling cart and wheelchair traffic. It’s 1/2” mesh size is ADA compliant and also prevents small tools and other objects from falling through. It also easily satisfies the “15 mm ball test” requirement, common in Europe and offshore applications. Adjustable quad-head grating pedestals allow for fast, smooth installation and readily adjust to sub-floor contour to provide a level flooring surface. MiniMesh™ panels are available in three surface textures -- smooth, meniscus, and gritted. Corrosion resistant and fire retardant, MiniMesh™ grating is the ideal alternative for many applications. MiniMesh™ is produced in 1-1/2” depth, 3/4” top mesh, 1-1/2” x 1-1/2” square bottom mesh, 2’ x 2’ panels, with 44% open area.